Some coworkers and I were talking about Steven Hawking, famous physicist from Cambridge University (seen at right, photo not mine). Apparently he made some comments a few years back that he was concerned computers could some day take over and overpower mankind, like something out of 2001: A Space Odyssey or The Matrix. Since making those comments, it’s my understanding that he has lost some control of his hands due to the progression of his illness (Amyotrophic Lateral Sclerosis, a.k.a Lou Gehrig’s disease). He previously used his hands to control the computer which allows him to speak, and possibly his wheelchair too. My understanding is that he’s currently controlling his systems through a series of eye blinks. Part of me is worried about what will happen when he loses control over even that ability, and essentially becomes silent and still, in spite of his brilliance. But then another part of me sees an ironic opportunity. As we were talking, the idea came up that if he were unable to control his chair or speech computer, why not hook it up to some wifi and a web interface, and allow others to take a turn? Go to the website, drive Dr. Hawking around, say things to strangers passing by… what fun! And no one would be the wiser. I’m not so worried anymore. I’m sure it’ll work out. Looks like your Utopia is more like a Fruitopia. i cannot believe that i found your blog! it is good to see that you are still alive and well. say hello to steph for me (if she remembers who i am). garret johnson hangs out with me at open door every now and then. we get to make music together, it’s like the old days at your dad’s church… ahh, now we just need you to come back and write some music for us to play. 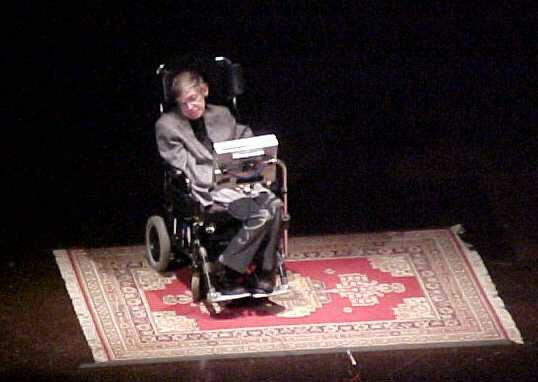 I wholly endorse the driving around of and saying of things via Hawking’s chair. I would use my 5 minutes of Hawking-ness to re-enact his various cameo’s on the Simpson’s. It would be amazing, women would weep for joy, children would frolick with glee, it could potentially be the catalyst for world peace.